Global population is forecast to reach around 9 billion by 2050. To feed the world, global agricultural output must increase by around 60% from present levels. This must be achieved against a background of increasing competition for natural resources such as water, feed ingredients and farming sites. Maintaining environmental integrity while massively increasing food production will require farming systems to reduce their unit production environmental footprint. Many farming practices that are regarded as sustainable today will not be acceptable when scaled up. Sustainable intensification of aquaculture means doing more with less. The Sustainable Farming Systems Programme aims to help aquaculture become a more efficient user of natural resources, both in terms of farm productivity and environmental efficiency. The programme develops better management practices for major aquaculture farming systems, and promotes aquaculture as a secondary or additional use of water resources. The programme focusses on practical interventions that can be directly achieved by small-scale farmers in a developing country context. 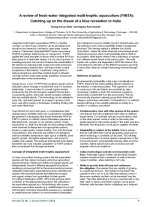 Development of better management practices for key aquaculture production systems. Organising small-scale farmers into associations to facilitate cluster-based approaches to extension. 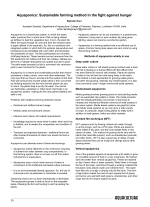 Development of culture-based fisheries as a secondary use of water bodies. 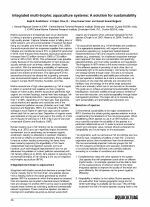 Development of strategic policy frameworks to guide governments and development agencies in promoting sustainable intensification of aquaculture. 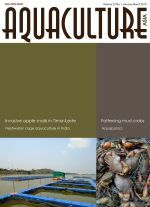 Current status of freshwater cage aquaculture in India; Fattening of mud crab Scylla serrata in estuarine region of south-eastern West Bengal; Aquaponics - sustainable farming method in the fight against hunger; aquatic invasive apple snails (Pomacea spp.) in Timore-Leste - current status, spread and management in rice fields; NACA Newsletter. Aquaponics is a closed-loop system in which the waste water produced from a tank of fish is used as fertiliser to feed a bed of vegetation. In turn, the plant life filters the water through its roots and the cleaned water is returned to the fish tank for reuse. Aquaponics is a form of integrated food production system in which the wastes from one production compartment are used as inputs for others. 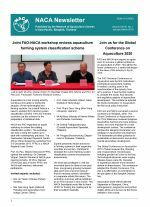 Joint FAO-NACA workshop reviews aquaculture farming system classification scheme; Join us for the Global Conference on Aquaculture 2020; Expert Consultation on Genetically Responsible Aquaculture; Strengthening governance in aquaculture; Pike perch and in-pond raceways; Quarterly Aquatic Animal Disease Report, April-June 2018. FAO and NACA have signed an agreement to convene a global conference on aquaculture in 2020. This will be the fourth conference in a series that began at the dawn of the industry in Kyoto, 1976. Aquaculture 2020 will be held late in the year in China. Arrangements, programme and partner details will be announced via the NACA website in due course. 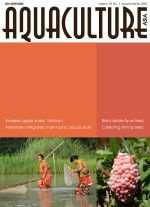 Concept of seed production of Heteropneustes fossilis in farmers' fields in West Bengal, India; Fishing gear and practices in flood waters of Assam; Fisherwomen empowerment: Shedding light on the invisible gender; Integrated multi-trophic aquaculture systems: A solution of sustainability. Marine aquaculture of high value species such as fish is generally reliant on external food supplies and has a negative impact on water quality, generating high organic and nutrient loadings. Integrated multi-trophic aquaculture offers a solution to reduce environmental impact of farming systems, culturing complimentary species that can recycle nutrients and reduce nutrient pollution while generating additional products for sale. This article looks at species selection and integration of trophic levels in system design. Aquaculture has seen spectacular growth in recent years, and Aqua 2018 celebrated aquaculture’s role as one of the most important food industries worldwide. Held 25-29 August in Montpellier, France, Aqua 2018 brought together scientists, practitioners, students, industry and civil society to highlight the latest global developments in aquaculture research and innovation. Asian Aquaculture 2018 is dedicated to the sustained progress of aquaculture in the Asian region. The conference will provide a better understanding the systems practiced, highlighting regional needs and constraints within the global context of sustainable intensification of aquaculture. The conference is organised by and will be held at the Asian Institute of Technology, Thailand. Abstract submission and early bird registration is available until 30 September. Please visit the conference website for further information. Integrated multi-trophic aquaculture is a flexible concept, on which many variations can be developed and should not be viewed as confined to open-water, marine systems. Freshwater integrated multi-trophic aquaculture, perhaps better known as aquaponics, applies the same principles as those used in marine integrated multi-trophic systems. In particular, using plants to reduce phosphorus (and other nutrient) levels in effluents can help farmers meet water quality guidelines and prevent eutrophication in the environment. Invasive apple snails (Pomacea spp.) 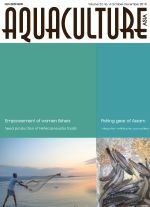 in Vietnam: Short review; A review of fresh water integrated multi-trophic aquaculture: Catching up on the dream of a blue revolution in India; Pre-pupae (larvae) of black soldier fly - a potential alternate protein source for aquaculture feeds; Penaeid shrimp and giant prawn seed collection from Rupnarayan River in Purba Medinipur, West Bengal, India; NACA Newsletter; First training course on culture-based fisheries held in Nha Trang, Vietnam.